The 31st of March was the last day the Park Service could have USDA "Wildlife Services" shoot deer under the terms of the warning signs and public announcements they had posted. On that day, no shooters arrived, but protesters did, condemning the 4 days of slaughter in Rock Creek this winter, and opposing all plans to continue. At the height of rush hour, a police cruiser parked in the area on Oregon Ave where they often park during the deer slaughter, only to leave 45 minutes later and not return. As darkness fell, roads that would close at 6:30Pm on a night of shooting remained open, police and park rangers were nowhere to be found-the Park Service had thrown in the towel. On Jan 6 USDA "Wildlife Services" was claimed to have shot about 20, on Jan 9 they were claimed by someone to have shot only 16 before being effectively driven off by protesters. That night they did not want to move dead deer on open trucks past camera-wielding protesters. When the protesters stood their ground against the police, the deer apparently were moved to covered trucks, taken past the protesters, and within an hour the shooters had quit. In February they returned, killing deer on Feb 24 and 25. 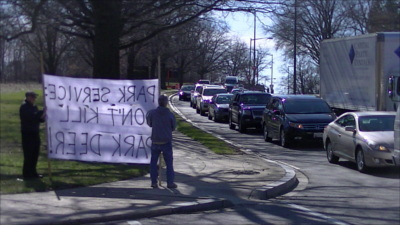 That time no formal protest was organized, but activists harassed the "golf card" and barricade crews on Oregon Ave. Either this was less effective than the protests or USDA had gotten the hang out of slaughtering deer in Rock Creek, as they must have done most of their killing on these two nights. If they only killed 36 deer the two nights they were opposed by protesters in Jan, that means to get to 106 deer killed with only the two nights in February they must have averaged 40 a night on Feb 24 and 25, twice as many as when protesters were present! One week later, a badly wounded deer was found by a dog walker and Park Police or rangers had to finish her off. From Feb 26th on activists hung "Bambi" posters condemning the hunt, one version showing the deer who had to be finished off a week later lying dead in Rock Creek. The Wildlife Services sniper teams were not detected once after Feb 25, with nightly surveillance patrols in Rock Creek looking for them. On the last day of the Jan 6-March 31 season, protesters returned to ensure that the killers did not attempt to fill their quota, not knowing how many had been killed to date. 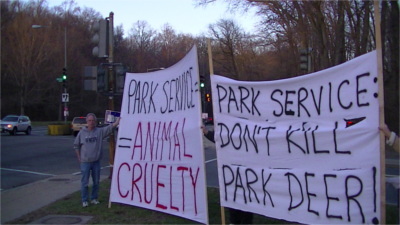 The Park Service, by not saying they were finished, exposed themselves to a month of gory posters being posted in Rock Creek Park condemning the killing.